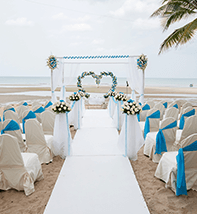 Are you considering a Destination Wedding? 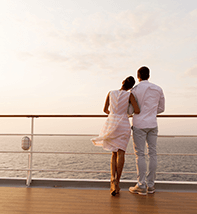 Let our Romance Travel Experts help take care of the details! Offer expires March 31, 2037. Destination weddings are intimate affairs shared with only your closest family and friends. It's a chance for you to enjoy the company of those closest to you for not only a few hours, but more like 2-3 days, making it a true celebration. The planning process for a destination wedding is very different from a traditional wedding. Most likely you won't be able to visit the actual wedding location, taste the food, have a cake tasting, or get to know the minister who will marry you before you arrive. Not to worry though. This is why we stress the importance of consulting with a Destination Wedding Specialist, who will help with all of these details. Unlike traditional weddings, you shouldn't expect to have an elaborate dress with an enormous train and a huge wedding cake. Instead, the dress should fit the destination. For example, most beach wedding brides will have light, flowy dresses that are less formal, and easier to walk in the sand with. The cake will most likely be provided by the resort. Destination weddings can be a fun and memorable experience for you and your guests, and by keeping your guest list smaller than you would back home, a destination wedding can also save you money. Every anniversary is special and deserves to be celebrated! For wedding anniversaries, it's especially important to remember why you fell in love in the first place and take that time to reconnect. 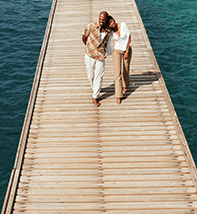 Going away on a romantic anniversary trip is a great alternative to traditional and modern anniversary gifts. It's easy to buy material things, but nothing says "I love you" like traveling and creating memories together. Our Romantic Travel Experts have taken the list of ideas for traditional and modern anniversary gifts and put a travel-related spin on them. See our personal vacation planners for details.